Talking about swaddling blankets is a lot like talking about cutting toenails. Neither is very likely to get you invited to the next cocktail party. But you can’t blog about how critical swaddling is without also talking about swaddling blankets. What are other people using? Which ones work best? Or don’t work at all? So, I implemented a highly scientific study of the swaddling blanket market. This looked something like asking peeps on Facebook and on the Troublesome Tots G+ Community. Over 200 people chimed in. I’m pretty sure it qualifies as the most robust analysis of the swaddle blanket industry ever. Which makes me the world’s leading swaddle blanket analyst. Which is so stunningly uncool that we’ll simply agree never speak of it again. Moving on. 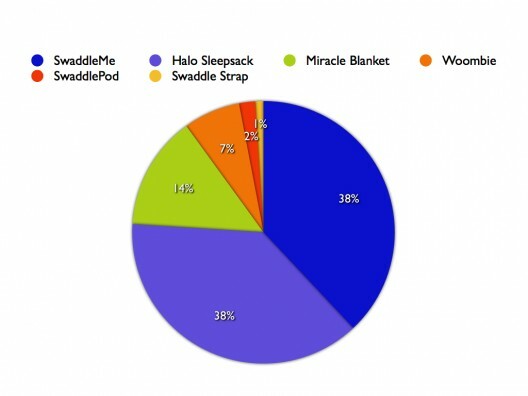 By a large margin, the two most popular swaddling blankets are the SwaddleMe and Halo Sleepsack (with velcro). Both of these have a sleeping bag pouch to keep legs warm and a velcro wrap to keep the arms down and minimize the startle reflex. Both provide idiot-proof velcro which is helpful for those of us who are baby-wrapping-challenged. This means they also both have the DISadvantage which is that some babies are strong enough to break free of the velcro. Please note that while the sleeping bag idea is a great way to keep baby toes warm, there is no soothing benefit from having their legs IN the pouch. Swaddling is all about the arms and upper body. Occasionally somebody will tell me they’re weaning baby off the swaddle by starting with the legs. This is a lot like cutting down on your coffee consumption by not eating coffee ice cream. Personally I like both the SwaddleMe and the Halo Sleepsack. They meet my key criteria in that they’re inexpensive (~$20 each), do the job, and are easy to use. That being said, the SwaddleMe is my FAVORITE choice for one simple reason. You can use it with baby’s legs IN or OUT of the pouch. Why would you care about this? Because if your baby is sleeping in a Rock n Play, swing, car seat, etc. you’ll need access to your baby’s legs to safely strap him INTO those things. So the ability to leave the lower half of his body out of the swaddle will be key for you. As an added bonus the unused “leg pouch” will be between baby and the seat which gives you an extra layer of poop/leak protection. Surprisingly the SwaddleMe doesn’t include this in their marketing messages. Perhaps they should hire me for help with this. For “break out of the velcro” babies the Miracle Blanket is a popular option. I’m also a big fan of these. PROS: While no product is 100% break-out-proof, the Miracle Blanket comes darn close. CONS: At $30 they’re almost 50% more expensive then their velcro brethren. Also the Miracle Blanket is more challenging to get on. Wrapping the baby up in what is effectively straight jacket is no small task. Failure to get it right will lead to more “baby popping out” problems. The Woombie and SwaddlePod are both stretchy sleeping bags that make your baby look like a cute little sweet pea. I’ll be honest – the only difference between the Woombie and the SwaddlePod that I can discern is that the Woombie costs 2X as much. Only a few peeps are using these but those that are absolutely ADORE them. Aptly named, it’s a strap with velcro. CONS: They’re a bit expensive ($28) and they don’t sell them on Amazon (aka where I buy everything other than food). Believe it or not some people use actual BLANKETS. If you’re looking for the best swaddle blanket you want an Aden + Anais muslin swaddling blanket (preferably the 47 X 47 inch jumbo size). A small but stalwart group of fans raved about these and I also can personally attest to their awesomeness. I wouldn’t normally go for a fancy swaddling blanket but these are well worth it. They’re giant and do a fantastic job of keeping baby from popping out. They’re durable, fold up small so that they can be easily carried in a diaper bag, and they look cool. Also they’re muslin which is amazing for it’s ability to keep baby warm in the winter and also cool in the summer. Did I miss any swaddle blanket gems that I should know about? Good/bad swaddle blanket experiences you’ve had?